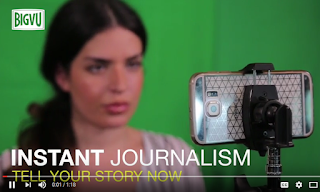 Anyone with a smartphone can now be a professional news anchor. BIGVU has created an app (iOS and Android) that combines virtual studio (backgrounds, graphics, and text) with a scrolling text telepompter to allow the simple and fast creation of video reports. 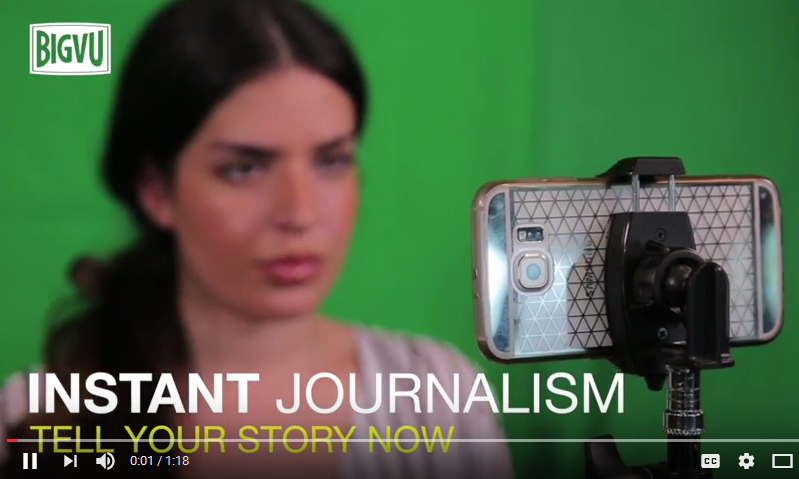 Virtual News Studio - select or create an eye-catching backdrop. Turns any location or environment into a professional looking news studio. Mobile Teleprompter - easy to create a simple text script that scrolls on the display allowing the reporter to simply read the lines. It automatically adjusts to the presenter’s reading speed. This allows almost anyone to create and record presentations as if they were in professional television newsroom. News Collaboration Platform - Multiple editors can simultaneously access the same stories through a shared, cloud-based virtual desk. Scripts are assigned to a specific reporter and automatically uploaded to their app. The anchor can capture several takes for the same story presentation in the BIGVU teleprompter app and select the best version to be uploaded to the cloud for distribution.